Single infertile female wrote a good post on this recently, she uses her car seat on the plane. Check her week in review posts, sorry I don’t have the link. Yeah, I’m incorporating some of her info for sure. How did you deal with air pressure in the plane? When’s your first flight with the two of them? Probably not until August, unless I do a last minute trip sometime sooner! I’d prefer sooner actually b/c young babies are honestly easier to fly with. We travelled when Molly was three months old. We used the ergo for the whole flight (baby carrier) and breast fed on landing and leaving. She was fine didn’t have any issues. However travelling with two – yowsers! How do you go to the loo when traveling alone? I was in a spot of bother when my husband had to spend half an hour at a counter and I and the boys were in another part of the airport and just HAD to go to the loo right then. Had to go to the toilet for disabled , since it was big enough to fit all three of us and the pram and the bags. There was no way I was leaving anything unattended. I had to use many, many wipes on the boys afterwards, they just did not leave any reachable surface untouched. Lovely. But I did not suffer the indignity of wetting myself. That was what I was focusing on when wheeling the circus out of there. Oh, flying. I’m going to take my first flight with two next month. Reading this, I realized that there are incredible variants on flying experience. I’ve done lots of long-hauls of five+ hours with M, which I don’t think you’ve done, but I’ve not done a single layover, of which you have done many. How long do you need for a layover? Yep – I’m anti buying an extra seat (if money is an issue & it’d cause you to not be able to do the trip), but of course that’s for flights of < 3 hours. If we were doing a 4-8 hour flight, I'd feel very differently about that! I have another question: Do you have thoughts on timing of shorter flights? My sister won’t schedule during nap, but I tend to. Some of that is differences between our toddlers, but I’d love to hear your thoughts. I’ll address this more, but I ALWAYS schedule during naps is possible. Maybe that’s because we always have a layover, so it’s unavoidable to not be still traveling during nap time, and I’d prefer to be able to nurse the kid to sleep for his/her nap (I’m talking the 0-2 age here). We’ve probably travelled quite a lot with our little boy Toby. Living in NZ to go anywhere flights can be quite long. We are super lucky that he is a sleeper. Our most recent trip was to the Uk two 12 + hour flights one way. He was 23 months old so no extra seat for him.The flights are normally late around midnight departures. We make sure the day before and that day he gets lots of running around outside time. He gets warm milk as we taxi and it puts him to sleep. He seems to sleep the majority of the flights. We are crazy lucky! When he is awake our iPad with drawing games etc life saver. I have just been catching up on your blog as we have just been to China and it’s blocked I was sad 😦 we left him at home this time. A week without him that was hard ! 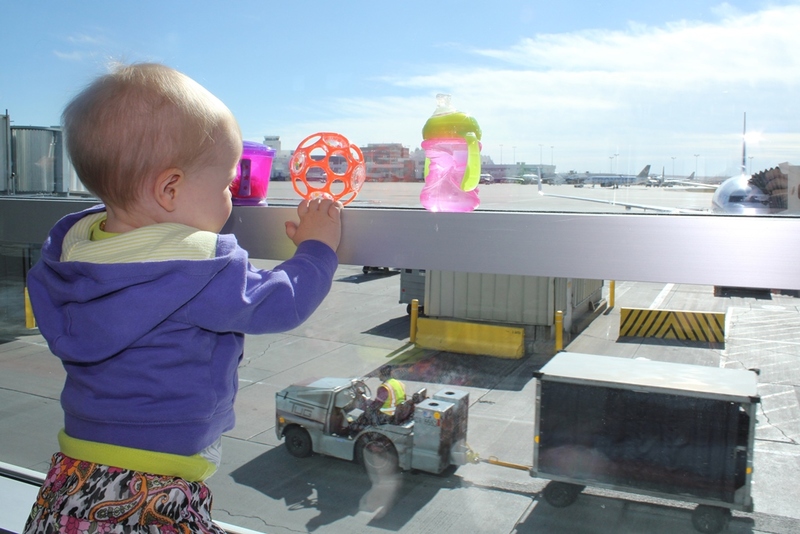 At what age are toys useful and awake on the plane better than asleep? When are snacks helpful and what snacks do you recommend? ← The Monday Snapshot – Comparisons & Sleep!